Without the proper legal awareness needed to stay in compliance, you may face grave legal and financial consequences. This recording will show you how to continue to help the people you’ve been trained to help while still protecting yourself from many legal pitfalls. 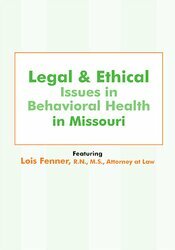 In this recording, attorney Lois Fenner will entertain and enlighten your day and you'll leave with a greater understanding of the latest Missouri laws as they relate to behavioral health. You will take home practical strategies to minimize and manage legal and ethical risks and you will learn how to immediately implement these risk reducing strategies into your practice. Explore the legal and ethical considerations for the treatment of minor populations in Missouri with regard to age of consent, confidentiality and custody concerns. Designate the treatment provider’s responsibilities relating to mental health issues and duty to warn law in Missouri. This self-study course includes 5.5 hours of state specific ethics instruction. Not all boards allow ethics credit for self-study products. If ethics is not specified within your licensing board’s approval statement below, please contact your board to determine the applicability and amount of ethics allowed. PESI, Inc. designates this self-study activity for a maximum of 6.0 AMA PRA Category 1 Credit(s)™. This activity was originally recorded on 12/21/2018. It was last reviewed on 12/29/2018 and is valid until 12/29/2021.